In 2013, the Chief Judge of the Hillsborough County Court system created a new criminal subdivision of the county court to focus on people who have misdemeanor offenses. The court division was created for veterans, who suffer from military or service related conditions. The court considers the unique nature of issues related to veterans and the need for treatment in an environment that will help with wellness and the continuing necessity to help protect the public. Who is Eligible for Dismissal of Criminal Charges? The county criminal division of the Veterans Court allows people who are veterans, honorably discharged, who suffer from service-related mental illness, traumatic brain injury, substance abuse, and/or psychological problems to become eligible for the benefits of this program. There are certain offenses that are eligible for admission to the court they are listed in the court order. DUI charges are not eligible for the program. To be eligible, the defendant must be evaluated by the Veterans Administration or other state or federal court approved facility. The program is completely voluntary. Some cases are referred directly by the State Attorney’s Office to the Veterans Court, if they appear eligible. What Happens in the Veterans Treatment Court? Once assigned to the Veterans Court Division, there are court hearings that are required and will be set by the judge in charge of the Veterans Court. It is required that all participants continue to participate in recommended treatment. If the court determines that the defendant has not complied, the case will be discharged from the Veterans Court. The case will proceed as if it had been originally filed in a criminal division. How Are Criminal Charges Dismissed in the Veterans Court? The benefit of the Veterans Court is that upon successful completion, there is a court order administratively dismissing the charges. The program in misdemeanor court is 12 months. Under the 2013 order, only misdemeanor charges were eligible. A felony charge, until recently, was not eligible for this unique approach to handling our nation’s veterans. You can review the changes that occurred in 2015 here. Tampa Federal Criminal Defense Attorney has previously covered the Federal Pretrial Diversion here: Federal Pretrial Diversion Eligibility Criteria According to the Feds, “Pretrial diversion (PTD) is an alternative to prosecution which seeks to divert certain offenders from traditional criminal justice processing into a program of supervision and services administered by U.S. Probation. We just obtained their manual that details the processes used in evaluating these cases for eligibility. The Federal Pretrial Diversion Manual describes the assessment procedure, which is helpful to know in deciding how to help get a defendant into pretrial diversion. 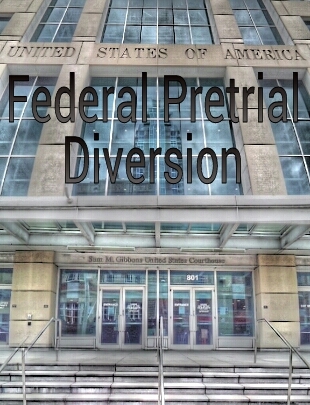 Review the Federal Pretrial Diversion Manual Here. Subject to this policy is any person identified, prior to or subsequent to the formal filing of charges, by the United States Attorney’s Office or pretrial services or probation office as a candidate for diversion and who meets the eligibility criteria identified in the United States Attorneys’ Manual, Title 9, Criminal Division, Chapter 22, Pretrial Diversion Program. The person identified as a candidate for diversion may seek advice of defense counsel and must sign a pretrial diversion agreement. The officer should obtain details about the candidate’s work history spanning the previous 10 years. The officer may ask the candidate for a resume to help establish employment history or gather pay stubs and tax records to help verify previous employment. If documents relating to past employment are not available, the officer should contact collateral sources or former employers to verify past employment. After investigating and verifying past employment, the officer should ascertain whether employment program referrals are appropriate. If the candidate’s current employment would be jeopardized by an employer’s knowledge of the candidate’s participation in the diversion program, the officer should use pay stubs or other means of verification. The officer also should conduct employment contacts if such contacts will not jeopardize the candidate’s continued employment. The Eligibility Criteria for the DOJ Pretrial Diversion Program have been updated. The disqualifier for having a history of substance abuse (alcohol or drugs) has been removed. 4. Accused of an offense related to national security or foreign affairs. Federal Pretrial Diversion a Possibility? Call 813-222-2220 .